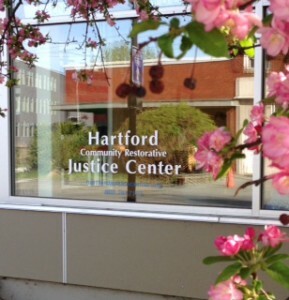 The Hartford Community Restorative Justice Center works in partnership with the community to provide programs and services aimed at reducing crime and resolving conflict in the greater Hartford area. Our programs are based on restorative principles: taking responsibility for one’s actions, repairing the harm done to victims and the community, and including all those affected by the crime or conflict in the resolution process. We serve the towns of Hartford and White River Junction, and the nearby towns of Barnard, Bridgewater, Hartland, Norwich, Pomfret, Quechee, Royalton, Sharon, Stockbridge, West Hartford, Wilder, and Woodstock. We rely entirely on local community volunteers for our panels, conference facilitators and COSA members. In return, we provide training in restorative principles and practices, many volunteer opportunities, and a chance to be part of this very exciting and rewarding work! Contact us at (802) 291-7173 for more information.